This book presents the Chinese and Western diagnosis and treatment of glaucoma, cataract, ptosis, macular degeneration, dry eye, floaters, diabetic retinopathy, hypertensive retinopathy and more common eye diseases of seniors along with a wealth of self-care techniques. 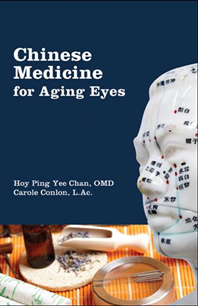 Learn how Chinese medicine can help your senior patients in the prevention and treatment of eye disease and how an integrated healing approach can be the most effective. ​Full general index, plus herbal formula, differential diagnosis and treatment principles indices. This book is intended as an expanded guide to the clinical application of ocular diagnosis and periocular acupuncture. 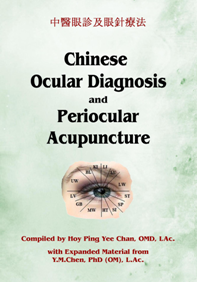 It includes the original information presented in the book Window of Health---Ocular Diagnosis and Periocular Acupuncture, compiled by Hoy Ping Yee Chan, OMD, in 1996 as well as current clinical information on this method from Y. M. Chen, PhD (OM), L.Ac. Ocular Therapy, developed in China over 45 years ago by Dr. Peng Jingshan, utilizes the microsystem which encircles the eyes. This system of diagnosis and treatment has gained international recognition as a simple and effective means employing acupuncture to assist the entire body in its healing process. Chinese Ocular Diagnosis and Periocular Acupuncture is designed for practicing acupuncturists wanting to expand their therapeutic options.